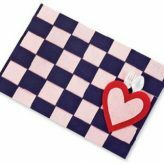 Posts Tagged "Aleene’s Original Tacky Glue"
These quick woven felt placemats are an easy craft that can even be done multiple times per year. 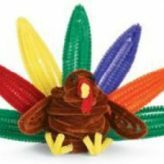 These can be decorated with different colors and designs, not just hearts for Valentine’s Day, but Thanksgiving, Christmas, St. Patrick’s Day, and more! Start with a sheet of purple felt. Fold it in half. While the felt is still folded, draw a series of lines across the fold about 2″ apart. Do not draw them all the way to the edge – leave about ½” at the edge. Use chalk and the ruler to draw the lines before cutting the felt. Use a damp sponge afterward to wipe off the chalk once the mat is put together. Starting on the folded end of the felt, cut along all the lines. When you unfold the piece of felt, there should be ½” border that is uncut. Using a sheet of pink felt, cut strips about 2″ wide that are as long as the width of the purple felt. Lay the purple felt on a table so it’s lengthwise. Starting on the upper left corner, help the girls weave a pink strip down through the first slit, up through the second, down through the third, and so on through all the slits. Weave the second strip of pink through the purple so it alternates from the first strip. Make sure that each new piece of felt is pushed up next to the previously woven piece. Continue weaving strips in this way until there’s no room for any more strips. When you’re done weaving, secure each strip of woven felt using glue. You might also have to trim the woven edges a bit to make the edges of the place mat even. Trace a heart onto the red felt, and then a smaller heart onto the pink felt, trying to keep the same basic shape of the heart. Cut out the pieces. Only glue the edge of the “v” of the larger heart onto the mat as shown. This will leave a pocket to hold the silverware. Glue the smaller heart onto the larger heart. 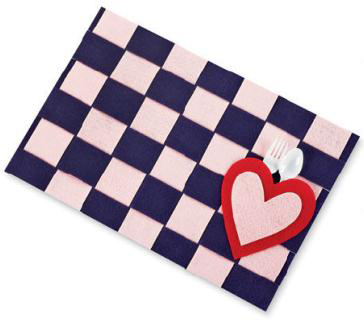 Let dry before using your woven placemats! Adults should handle the scissors and cutting when working with younger girls. 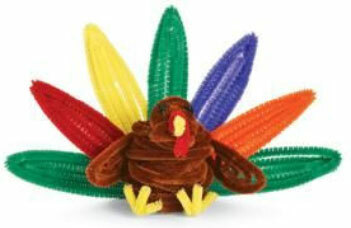 The Pipe Cleaner Turkey is a terrific Thanksgiving project! This project is perfect for Brownies and Juniors, and can be easily done in 30-60 minutes. I would be helpful for the leader to complete one before the girls attempt it so it’s easier to help them. As well, the girls may need a model in person to refer to. Bend 1 brown chenille in half. Set on work surface. To make head, connect 6 brown chenille by twisting ends together. Wrap around the large round marker overlapping so that the length does not exceed 2 inches. Glue the bent brown chenille into the head piece. Set aside. Take one brown chenille and wrap around the highlighter without overlapping to make the neck. Slip over the remaining chenille sticking out of head. Glue the top edge into head. Bend the chenille wire holding head/neck assembly into an upside down U shape. Set aside. The body requires 24 brown chenille stems that are connected and wrapped around the large paint bottle. Slip off bottle and gently squeeze into an oval shape. Pick up head/neck assembly, and glue into the body. Make sure the head is bent over the top of body, as if turkey is looking at you. Set aside. To make a wing, connect two brown chenille stems. Refer to photo to see shape of wings. They are shaped by hand. The stems touch only at the top of the wings. Glue them together along top to hold shape. Repeat for second wing. Twist wing ends together, so that they are 2 ½ inches apart. Glue wings onto turkey back. Bend the wire at the top of the back in, to close off opening behind head. Set aside. Cut one yellow chenille in half to make feet. Take one of the halves, and bend it in half. Measure ¾ ” back from bend, and bend the chenille at a 90 degree angle. Twist the ¾” together then separate the strands. Bend one piece up to make a V shape for the second toe. Measure and bend stem back at the ¾” mark. Repeat for third toe. Repeat step to shape other foot. Bend the leg ends up ½” from end, and glue into body base front edge. Set aside. Cut a 4″ piece of yellow to form beak. Bend in half, and then half again. Attach to head with glue. See photo for placement. Set in front of you. Cut a 4″ piece of red to form warble. Bend one end to fit over top of beak, allowing 1-¾” to hang down. Bend remaining back up, and twist to secure. Glue onto top of beak. See photo if necessary. Place turkey in front of you. Roll one end of black chenille into a little ball. Cut stem 1″ from rolled end. Stick stem end into head, and glue into place. Repeat for second eye. Refer to photo if necessary. You need five stems for each feather: 15 green, 5 red, 5 yellow, 5 purple and 5 orange. Twist 5 of the same color together and make a bend 7″ from one end to form an upside down V. The next bend should be 6″ further. Each time you go up into the feather shape, the next V should be slightly smaller to fit inside the previous one. Repeat until all the feathers are assembled. Lay 2 green feathers with their twisted ends together forming a horizontal line. Glue the purple and yellow feathers on top of the green ends to form a V shape at the top. Attach the orange and red feathers in like manner so they lay above the 2 green feathers at base. Glue the last green feather slightly above the orange/red ends. Refer to photo if necessary. Glue entire tail onto back base of your turkey. When twisting the chenille stems together to connect, be careful because the ends can be sharp. Cut black felt square in half to 6×9″. Fold up 3¾” and pin in place. Thread needle with floss & use blanket stitch to stitch up sides. Fold down flap 1¼”, press with finger to crease. 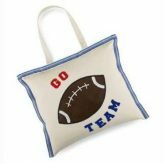 Center sticky Velcro under flap & attach to purse & flap. Use Revolution to cut out flowers & leaves from felt. Attach with tacky glue and daisy brads. Adult supervision is required when girls are using scissors and needles.